Richie Kotzen's new album, Salting Earth, opens with the sound of a guitar string being tuned. Or is it the sound of multiple Richies singing drone pitches in an almost Indian mantra sort of way? Or is it the prelude to a crushing hard rock track? Well, it's all of the above. And from the moment we hear the first tones, we know two things about the new album: We're in for something a little different this time, and it's going to rock pretty damn hard. If you've been following Kotzen for a while and are familiar with his solo albums, you'll immediately notice that this one has a different overall feel and sound to it. It's still the Richie Kotzen we all know and love, but the album has a sound and spirit all its own. A lot of that sound has to do with the way the drums and vocals were produced. Compared to other Kotzen records, the drums on this album have a much bigger sound. They're coated with a thick, warm reverb that simply makes them sound huge, and it's a marked departure from the typically quite dry and crisp drum sounds of his earlier records. Could this larger sound be the unwitting influence of having put out two records with the King of Bombast himself, Mike Portnoy, or was it simply a direction Kotzen wanted to take himself for personal reasons? Then again, with the vocal tracks: that same nice, warm, smooth reverb. But, where it makes the drums sound bigger, the effect on the vocals simply sounds more soulful; maybe more soulful than perhaps he's ever sounded before. In fact, the interplay of the drum sounds and the vocals cast a delicious, old-school warmth across the record. At times it really feels that Salting Earth would have been at home in the late-60s/early-70s golden age of rock and soul. If someone told me that this album had been recorded in Sun Studios, I'd believe them. That's the sound Kotzen was going for here, and that's the sound he achieved. Lordy, it's beautiful. But there's something else on this album, too, and it's hard to put my finger on. The Richie Kotzen oeuvre is a compelling artistic world that fuses hard rock and vintage R&B, but which often presents stories from the darker side of the human spirit. I don't mean that in a bad way, of course, but the fact is that Kotzen's lyrics have more Robert Johnson in them than, say, Daryl Hall. Kotzen's lyrics are often filled with references to drugs, loss, infidelity, pain, retribution. When Richie Kotzen plays the blues, he plays the blues. That's just part of the canvas he's painting on. It always comes out in his music, but on Salting Earth, with its heavy-sounding drums, big booming bass notes, growling vocals, and aggressive guitars, and vinyl warmth, he really manages to draw the listener into his world in a way he never has before - at least not in my opinion. Turn the lights off and the volume up, and listen to sounds swirl around you like they do in one of those old, vintage music halls. That's what this album sounds like, and it seems like a poignant example of everything Kotzen does best. Perhaps after the success of working in the more collaborative environment of the Winery Dogs, Kotzen had been thinking about what it is that he does, and who he is as an artist. Or perhaps sometimes the magic just comes together in all the right ways at the right times. 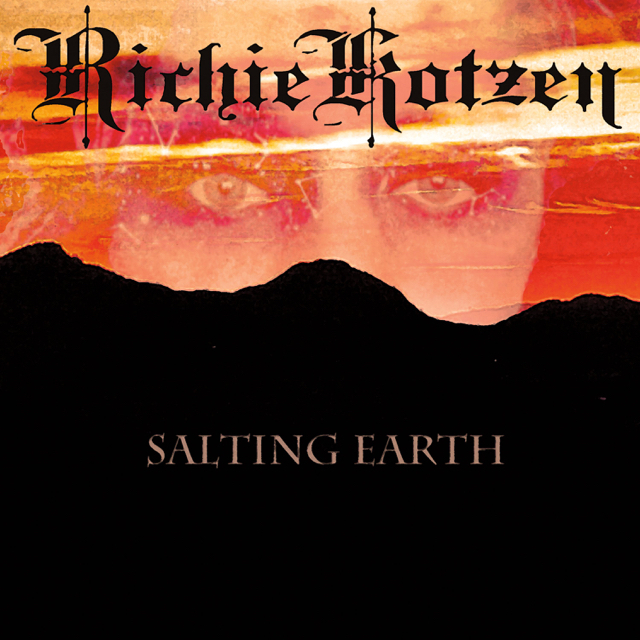 It is both impossible and pointless to choose a "favorite" Richie Kotzen album, but this one has all the best he has to offer, and I wouldn't be surprised if you ask me years from now which is my favorite, and I say Salting Earth.